The Sabrina is a kaleidoscope of 12 coloured gerberas, popping in the tones of sunshine yellow, saffron orange and raspberry pink. Gerberas are a playful and joyful flower, and consistently are in the top three most popular flowers in the world. The citrus palette of this bouquet conjures up images of fun afternoons in the sun and zesty, refreshing drinks. Colourful and festive, this bouquet is a perfect get well gift, or makes a brilliant birthday gift for a younger girl. When you need to brighten the day of someone dear to you, rely on the Sabrina. 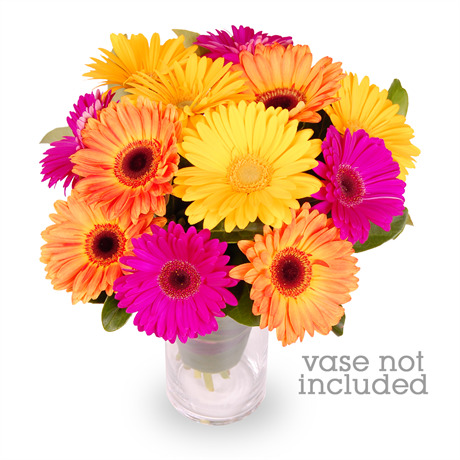 This vivacious bunch of gerberas does not come with a vase, but we recommend adding a regular vase which is available in gift options. Go all out and add a bouncy helium balloon and some chocolates- your lucky recipient will feel extra special.